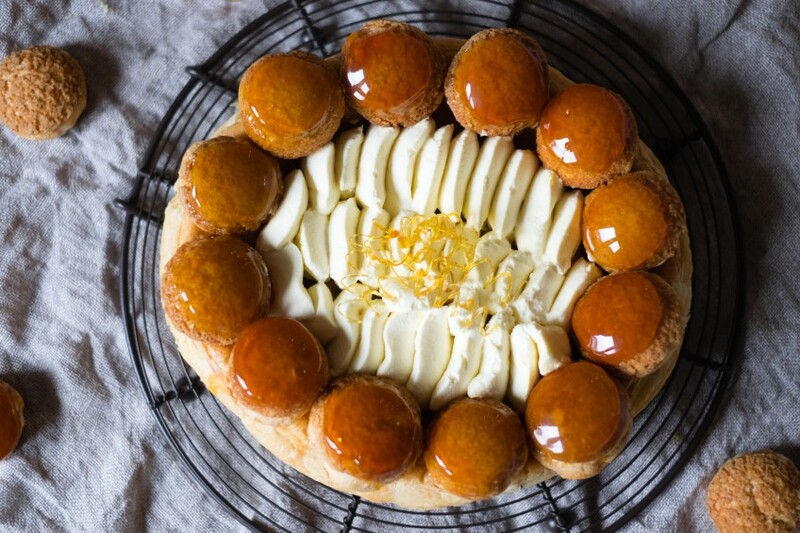 I’ve always wanted to make a St Honore, but I always found them a bit daunting. I mean look at it! Two kinds of pastry and hot caramel – which I did burn my fingers on twice! That’s a lot of work, not to mention the traditional filling, which should be a creme chiboust, which is a pastry cream, folded with french meringue. I wanted to feature salted caramel somewhere in this tart, so I didn’t want too sweet a cream to fill the centre with, also it was quite a lot of work to make this gateau, so to fill it with whipped cream was a nice little cheat. Not to mention my local waitrose was selling double cream for 10p a carton, even though it still had 6 days left on the use by. 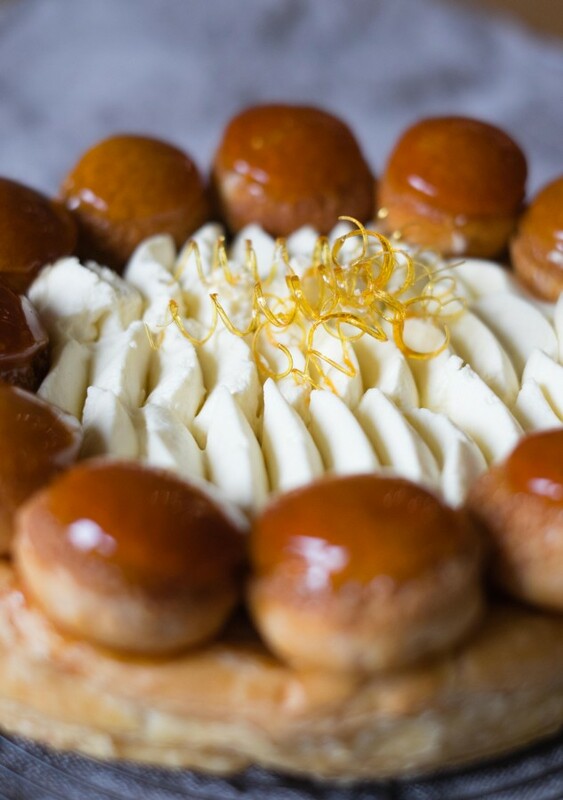 The St Honore is steeped in tradition, it’s named after the patron saint of pastry chefs and nearly every patisserie has their own version of this delicious gateau. It is commonly served as a large gateau like this or it can be made into individual gateaux. 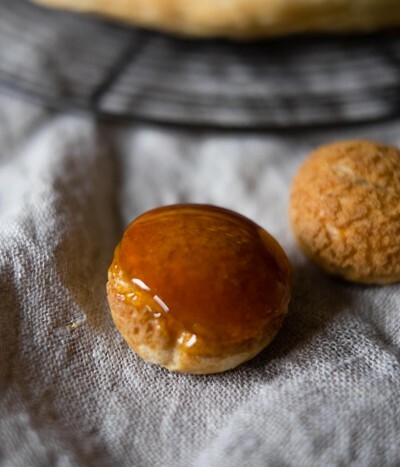 Two years on from starting this blog, I felt ready to tackle the mighty St Honore, I’ve got better at making choux and I quite like making puff pastry and caramel is one of the most fun things to work with, despite how hot it gets. So I took this recipe on, in what has become my usual way of working, the piecemeal approach. The puff pastry was made a month or so ago, I always make a full recipe, cut it into three and freeze it in labelled freezer bags, that way I always have homemade puff pastry in the freezer for pies etc. The salted caramel I made about a week ago, it keeps really well and I always make the full recipe and keep the extra jar for anything I might be making. Finally on the evening I made this, I just had to make the choux pastry and fill and assemble everything at the end. Fitting in blogging around a full-time job and looking after our new puppy, means that I have to really choose recipes that I can make over a few evenings. Something like this Salted Caramel St Honore is perfect for this. As of January, I’ve been blogging for two years now, the time has gone so quickly. I’ve made some new friends, learnt lots of things in the kitchen and generally had a lovely time, doing something I really enjoy and watching my readership grow. 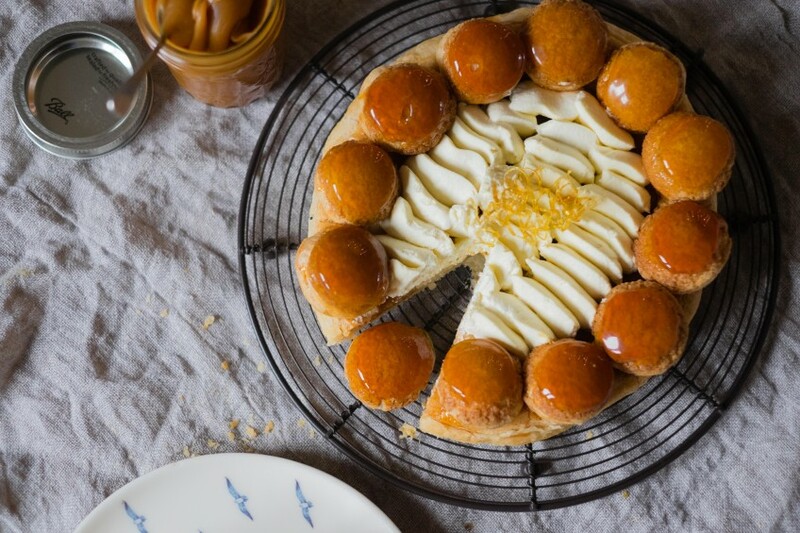 This Salted Caramel St Honore pulls together a lot of recipes I’ve made before on the blog, including puff pastry, choux pastry and salted caramel. Although this takes a bit of work, as you can see from the recipe, this is so delicious. I had to give some of it away, just so I would stop eating it, it really is that good! To make the craquelin, mix the flour, sugar and butter together in a bowl, using your fingertips rub the ingredients together until they resemble breadcrumbs. After about 30 minutes, remove the craquelin from the freezer and cut out as many 2.5cm circles as you can fit on the whole sheet. Return the circles to the freezer. 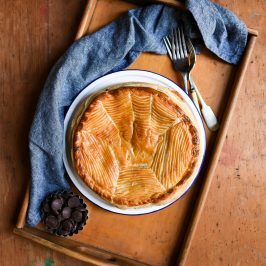 Take the puff pastry and roll it out to around 5mm thickness, cut out a 23cm circle using a plate or a cake tin as a guide. Transfer the pastry circle to a baking tray, prick the base with a fork and transfer to the fridge. Make the choux pastry according to the recipe, take the puff pastry out of the fridge and pipe a circle of choux pastry 1cm in from the edge of the puff pastry base. Then pipe another circle 2cm in from the first circle, so that you have two rings on the puff pastry base. Preheat the oven to 180C (160C Fan) Gas 4, prepare two baking sheets and draw 2.5cm circles on the reverse of some baking parchment, use all of the choux pastry and pipe blobs (you will have more than you need, but choux can't really be made in quantities smaller than this and there is enough salted caramel and creme chantilly left over for you to fill the choux puffs). Top each blob with a circle of the craqulin and bake the puff pastry base and the choux buns for 35 mins. Then turn the oven off and leave them to cool in the oven for a further 15 mins. 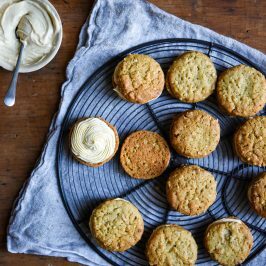 While the choux is cooking, make the creme chantilly, add the cream to a large bowl, add the vanilla extract and sift in the icing sugar. Whip the cream until it forms stiff peaks. Place a third of the cream in a piping bag fitted with a St Honore piping tip. 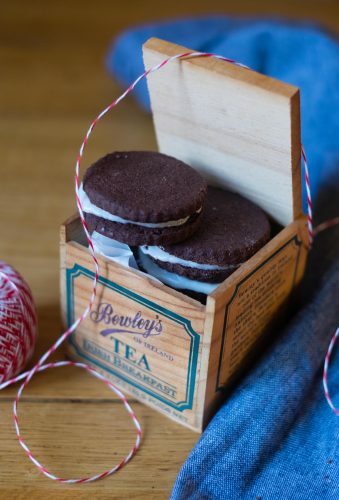 Place the rest of the cream in a piping bag fitted with a 1cm straight piping nozzle. Return to the fridge. Take the salted caramel, if it's too thick or too cold, warm it in the microwave on a low heat for 30 seconds, you want it to be piping consistency, but not too runny. Place the caramel in a piping bag fitted with a 1cm straight piping nozzle. Take the choux puffs and with a sharp knife, pierce a hole in the bottom of each puff, making sure it's big enough for the piping nozzle to fit in. Fill each choux puff with some salted caramel and then fill completely with the chantilly cream in the piping bag with the straight nozzle. Take the remaining salted caramel and pipe it in the centre of the pastry base and in between two two bands of choux pastry. Before you make the caramel, make sure you have everything you need to hand. 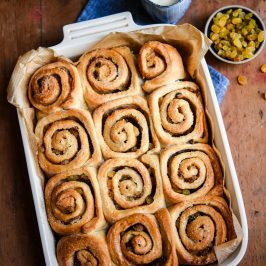 Place the puff pastry base on a wire rack with some greaseproof paper underneath, line up the choux puffs which you want to use on the gateau. Next make the caramel, this will be the glue that keeps the whole gateau together. To make caramel, put half the sugar in a heavy based pan and melt it over a gentle heat. Add the rest of the sugar and melt until it becomes an amber caramel colour. Dip the top of the choux puff in the caramel, you can place it in a silicone semi-sphere mould to set the caramel evenly. When cool, dip the bottom of the choux puff in the caramel and stick this to the ring of choux pastry, keep going until you have a complete ring of choux buns. Then take the creme chantilly with the St Honore nozzle and pipe stripes in the centre of the St Honore. *This is the choux pastry recipe you will need. *This is the puff pastry recipe you will need. *This is the salted caramel recipe you will need. To celebrate the 2nd Birthday of Patisserie Makes Perfect, I’ve spoken with a lot of the brands and people that have supported me over the last two years and I’ve managed to secure some great prizes for all of my readers. 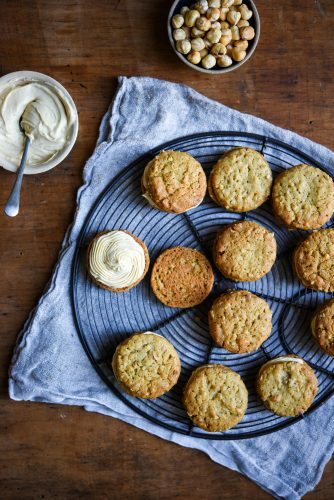 Kings Fine Foods have provided me with lots of fantastic ingredients to use on the site over the past two years, they’ve kindly donated a luxury bake-off hamper with a signed copy of Edd Kimber’s Book Say It With Cake. The second prize is a signed copy of Patisserie by William & Suzue Curley, I adore this book and I recommend it to anyone wanting to learn patisserie, it is a fantastic book. The other part of this prize is a Jing Tea set and Jing Teas as featured in my Religieuse blog post. I really hope you like these prizes I have managed to secure and that you continue to follow Patisserie Makes Perfect over the years to come. Thank you! 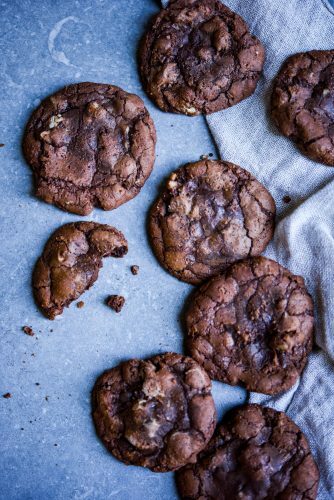 It does taste amazing – I love salted caramel too! 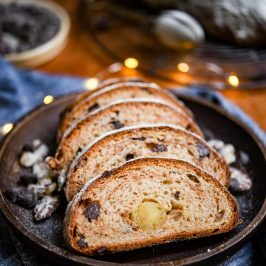 The chocolate banana bread, I could almost pretend it was healthy/good for me because it has banana in it! Baileys Cheesecake with Salter Caramel Sauce ….. its a definite on my too do list! I think mine was your Peanut Butter Oreo Mousse Bars! 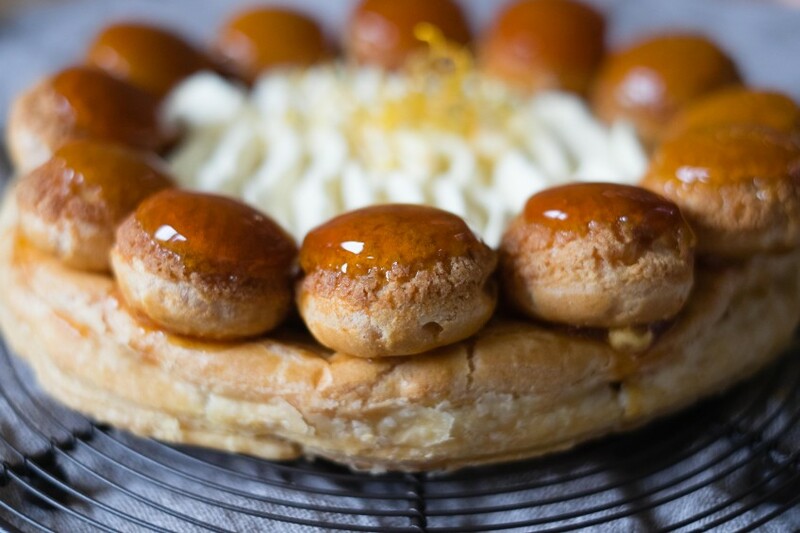 So many amazing recipes though 🙂 and this Salted Caramel St Honore looks amazing! I loved the Bailey’s cheesecake, I’ve not made it as I tend to drink the Bailey’s before it get’s anywhere near a cheesecake!! but my daughter made it and bought a slice home for me and it was delicious X I love the look of the Salted Caramel St Honore, what patience you have! 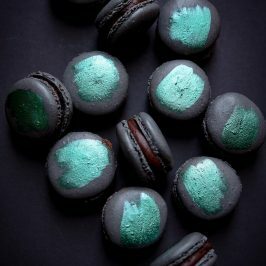 Salted caramel praline macarons sound amazing, but I doubt I’d ever do them justice! Your Lemon Meringue Pie!! Oh my goodnessssssss. Ooh toffee apple cake for me! The Baileys cheescake looked amazing! I love Baileys and I love cheescake so for me this is a win win!! Chocolate and Raspberry Entremet I made it a couple of times with great results for family celebrations. It llooks impressive, not OTT, and I will make it again. ECLAIRS – so lovely and pink!! 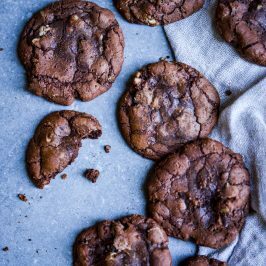 I loved the Spiced Chocolate Chunk Cookies – I like the chocolate with spices in it (like Maya gold) but can find them a bit too much to just eat as chocolate, so this is a great way to use the remainder of the bar! And your St Honore brought back lovely memories of my Mum, who made me one of these for my 11th Birthday cake! Your St Honore is really nice Angela ! I’m French and I don’t even have one on my blog 😉 As for the burnt fingers, it’s tooootally normal. I just discovered your blog but I really love it ! Peanut butter oreo mousse bars! Thanks so much Hannah. I was so pleased with how this turned out and you’re right, as soon as I’d tasted it I knew I had to give it away or I’d eat the whole thing with a spoon! Oh thank you Nicole, it means so much when a photographer as wonderful as you, say you like my pictures. I have a set of French Doors that I photographed this in front of and the Winter sunlight was kind to me that day. Hi *waves* I’m new here! Stumbled across you via Domestic Gothess 🙂 Your blog is amazing! I’ve spent ages trawling through your archives I’m in awe of your work. My favourite recipe from 2015 is probably the blackberry tartlets you posted on 20th Feb. They are adorable. I love the sugar spiral you’ve done here and there!!! So clever! Hi Emma – thanks for visiting, Domestic Gothess has a lovely blog. Bailey’s Cheesecake! oh yes please!! mini lime meringue pies were yum! Happy birthday to you!! Well, to your blog… And here’s to many more. This looks amazing and it was my favourite dessert as a child – we had such an amazing Patisserie in Athens near a friend’s house. 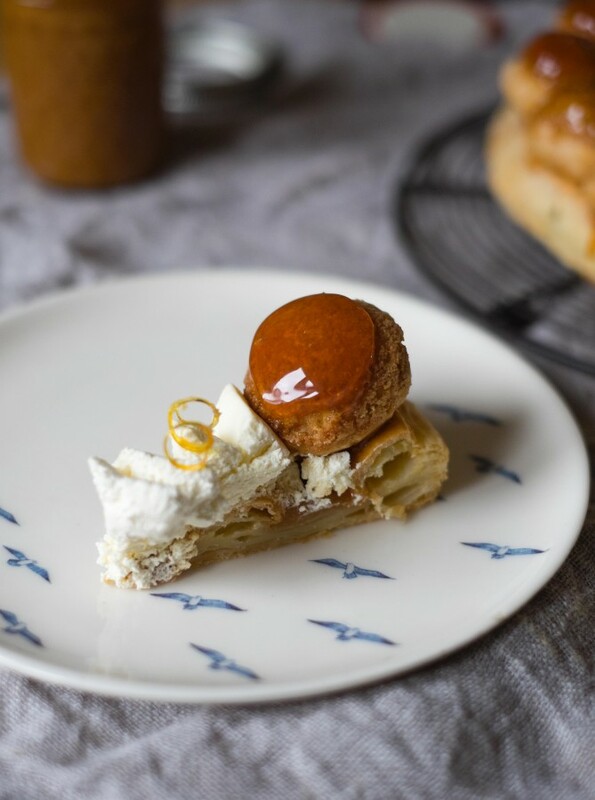 Everytime we visited we brought a St Honore gateau or mille feuilles…. this brings back many wonderful memories. I would love to try yours! Thank you Lucy! I’ve never had a St Honore before I made this and it tastes delicious. I need to find somewhere that makes them so I can eat it again without having to make it myself. 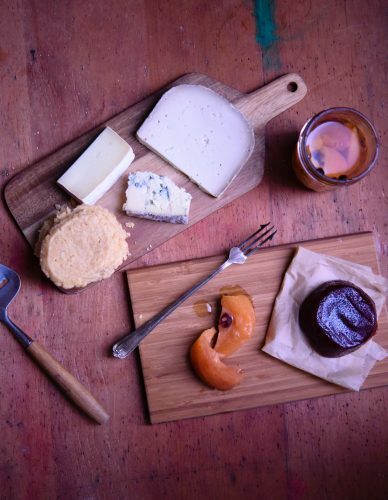 that St Honore looks PHENOMENAL!!! My fave 2015 recipe was the marbled mocha madeleines as it inspired me to get a madeleine tray and experiment with making madeleines! Madeleines are just perfect and I love how light they are! Enjoy your madeleine pan. I’ve just made your salted caramel sauce. I’m in love. I also feel a bit sick now as I didn’t prep enough jars and had to eat a fair bit of it out the pan!!!! Yeah it’s addictive, but heavy on the stomach 🙂 So glad you like it, I have a jar in the cupboard at all times for emergencies! Has to be the biscotti. The Pistachio & Raspberry Macaron Cake. 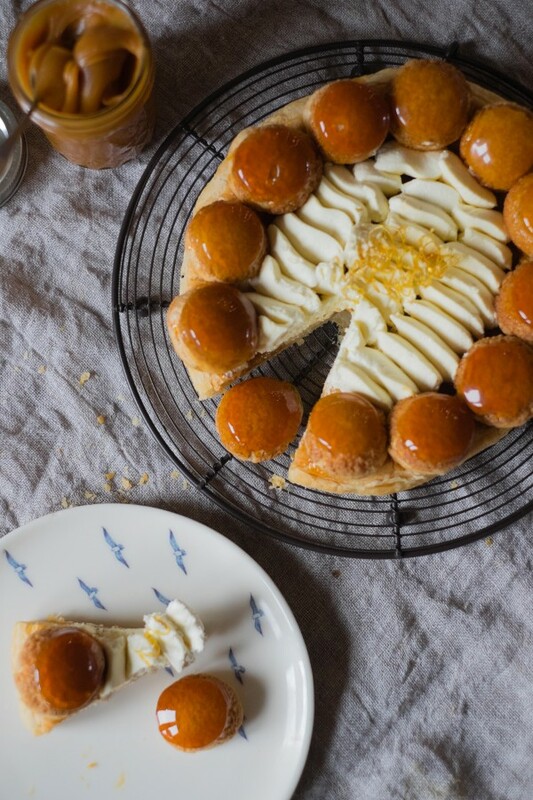 This one-Salted Caramel St Honore because it looks delicious and I love caramel! Coffee Almond Brownies sound yummy. The biscotti, I only discovered it after Christmas but have bookmarked it for next year, for edible gifts! This looks an amazing dessert….mind you, quite a few of your recipes look fabulous! Thank you Julia! I was so pleased when I finished this – I never expected it to turn out this well. The Salted Caramel Praline Macaroons, I love salted caramel! Definitely the Peanut Butter Oreo Mousse Bars for me – so decadent! The raspberry and rose dessert is a lovely combination. Your Baileys Cheesecakes with Baileys Salted Caramel Sauce was my favourite! I made them on New Year’s day when I had family round for tea! Delicious! My favourite recipe was the one for Dauphinoise Potato Pies! It is so innovative and I want to try these out on my family at Easter!